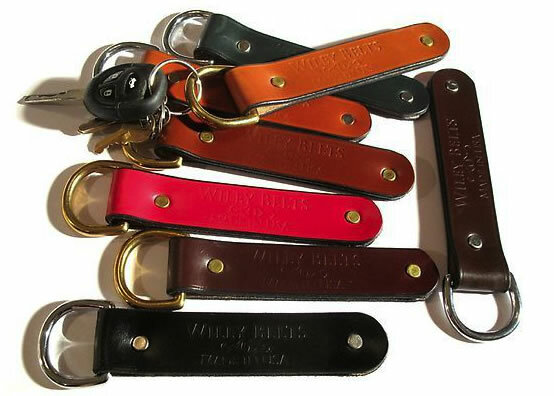 Brand new to the line, KEY FOBS! Choose from one of two styles depending on your personal likes. The Loop Fob starts with nine inches of leather folded over end to end and terminating in the capture of a solid brass square. The overall length is 5.5" and it fits the hand well, looks great and is very easy to keep track of. The Loop is available in brass and all ten colours of leather. The Pocket Fob has a flat profile, is 5.5" long as well and uses a D ring. The fob is long enough to stay in your pocket leaving the bulkiness of your keys out of your pocket. The Pocket is available in brass or nickel on brass and all ten colours of leather.